In Canada, Thanksgiving is celebrated on the second Monday in October. That is often the last full weekend of time that we have at the lake. We come home, tired but happy, and we host the family Thanksgiving feast with all the trimmings. Needless to say, I make as much as I can beforehand. It is a great way of doing it, as much of the food improves in flavour if made ahead. I make dessert, the turkey and the scalloped potatoes ahead of time. 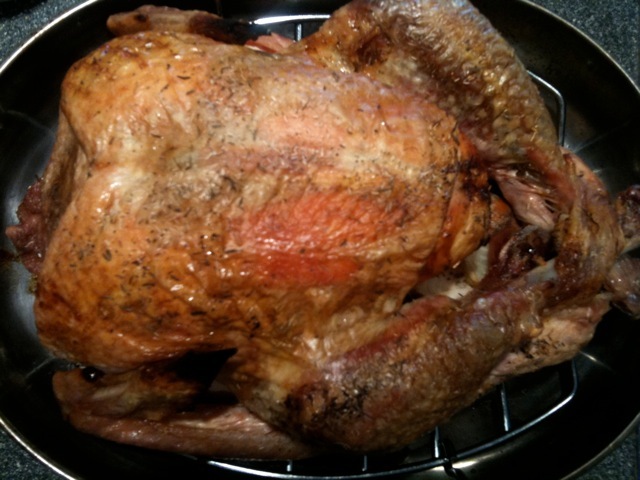 The turkey is simple, roast as usual, cool, carve and debone (it is way easier to carve when it is cold), place in a roasting pan and cover with stock. Chill or freeze. If I am freezing turkey, I put it into zipper freezer bags. To serve, defrost fully (if frozen). Remove from refrigerator one hour before reheating. In an oven proof roasting pan, cover the turkey with a lid or foil and reheat at 350 degrees for about an hour for a deboned 12 pound bird. This is the chilled bird ready for carving! Here is my recipe for scalloped potatoes. I love using the evaporated milk as it gives a creamy consistency and also helps keep the dish from curdling. I have to apologize that I somehow forgot to take a photo of the baked recipe! However, I must say it was yummy and all the guests raved about it. Heat 3 tablespoons of butter in a saucepan over low heat until melted. Blend in flour, salt and pepper. Cook over low heat, stirring constantly, until mixture is smooth and bubbly. Gradually stir in the milk and the evaporated milk, 1/2 cup at a time. Heat to boiling. Boil and stir 1 minute. I use my food processor’s slicing blade to cut my potatoes and onions. I put two potatoes and a half onion in the feeding chute at one time, that way both get sliced and the onion is evenly distributed through the dish. 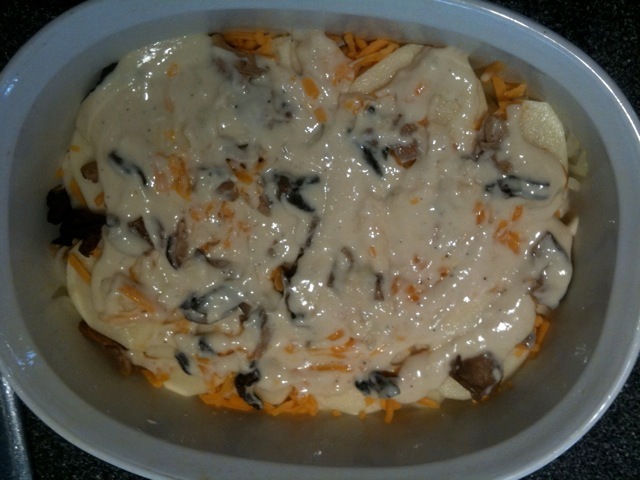 Arrange potatoes and onions in a greased 2 quart casserole in 3 layers, topping the first two layers with half the mushrooms and on third of the cheese and the sauce. Top the third layer of potatoes and onions with the cheese and the sauce. Bake until potatoes are tender, about 60-70 minutes. Let stand 5 to 10 minute before serving. Frugal Tip: While it is wise to stock up early on many items, don’t stock up on Holiday staples until later in the season. Most stores discount Holiday merchandise as the Holiday approaches. For example, I bought Halloween Candy in early September (our park hosts Halloween on Labour Day weekend. I bought candy for $15.00 a box in early September, the week before Halloween, the same boxes of candy were less than $10.00. If I could have, I would have waited and saved money. hmmm mouth watering….its looking delicious in the photos itself…will have to try this…. Sounds good but you don’t address the “making ahead” portion of the recipe. Can I make ahead and then reheat without compromising the texture?